Guide to Growing Purple Coneflower (Eastern Purple Coneflower; Hedgehog cone flower; Purple daisy; Purple rudbeckia; Black samson). 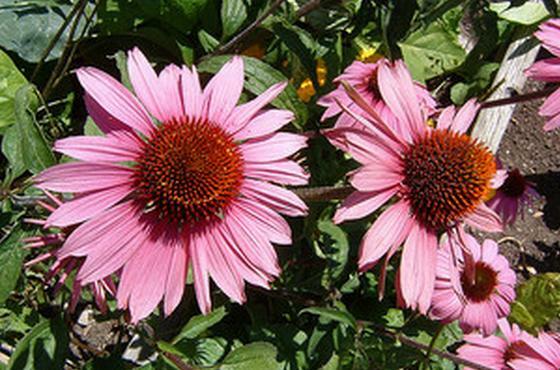 Echinacea purpurea is a perennial herbaceous plant commonly known as the Eastern Purple Coneflower. There are nine coneflower species in theEchinacea genus, they are native to prairies, and in the case of E. purpurea rock-strewn open woodland areas, of North America. 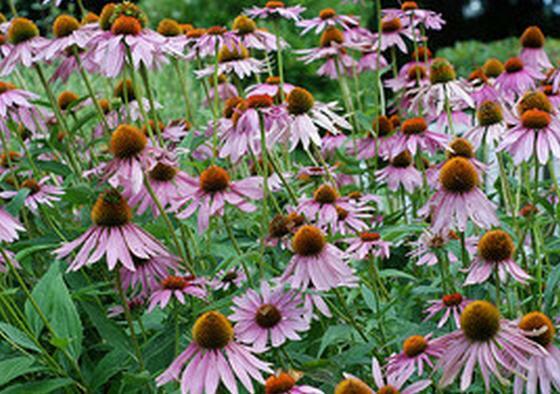 Other commonly grown members of the genus include Echinacea angustifolia (Narrow-leaf), Echinacea pallida (Pale Purple), and Echinacea paradoxa (Yellow Coneflower). As a member of the Asteraceae/Compositae family, Echinacea purpurea is closely related to members of the Sunflower, Yarrow, and Tidy tips. The leaves, roots, and flowers of Coneflowers have traditionally been used as herbal remedies by Native American tribes for problems ranging from infections to the flu. When rubbed onto the skin it is said to be helpful for treating wounds, bee stings, burns, and rattlesnake bites. It is thought to fight infections through reducing inflammations, and one of the chemicals that it contains – L-DOPA – has been shown to have anti-depressant properties. The flowers are used to make herbal tea. They make a great plant to grow in a wild-life garden as they attract birds, bees, wasps, and butterflies. Other advantages to growing Echinacea purpurea are that they are drought and deer tolerant, a great combination for many gardeners. Echinacea purpurea photograph by Jordan Meeter. Echinacea purpurea can be used throughout the garden in locations such as beds and borders, and as part of wild life, cottage or meadow landscape. They look fantastic when grown in mass with Black-eyed Susan. It is commonly grown as a cut-flower because of its large daisy-like flowers and hedgehog shaped central disc. Echinacea purpurea plants reach heights of between 24 and 72 inches, usually about 36 inches (60–180; 90 cm), and have a spread of 6 to 24 inches (15–60 cm). Plants are clump forming and upright. Leaves are present from spring to autumn, and are lance-shaped, coarse, dark green, upright, toothed, and about four to six inches (10–15 cm) in length. Purple Coneflower picture by asdfawev. Flowers come into bloom from the middle of summer through to early fall/autumn. Single six inch (15 cm) rayed (daisy-like) flowers appear atop long smooth stems. The flower rays are usually red-purple with greenish tips, though some varieties can be white or pink. The central disc is orange-brown and spiky, given rise to the species scientific name Echinacea (Echinos is the Greek word for hedgehog). 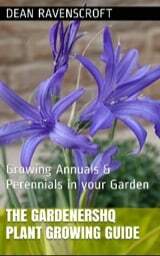 Seeds of varieties do not usually remain true and take at least two years to flower, and up to five years to reach their full height. Therefore, Echinacea purpurea is often grown from pencil-sized root cuttings taken towards the end of autumn or the start of winter. Plants can be divided in early spring, but this often has a detrimental effect on plants, leading to shoot branching and few flowers. If growing from seed, sow at a depth of 1/8th of in inch (3 mm) in flats in the autumn, or from stratified seeds at the start of spring when the temperature is about °F (13°C). Seeds take from 1–3 weeks to geminate at a temperature of 70°F (21°C). Space plants at about 18 to 24 inches (45–60 cm). For best results grow in an average soil that is deep and well drained. Plants are drought-tolerant. Locate in a sunny location for best results, but will grow fine in a partially shaded area. Deadhead plants before seed-set to prevent aggressive spreading. Deadheading will also prolong the blooming period. If you are growing Eastern Purple Coneflowers for an autumn display then cut back plants by about one foot (30 cm) just before they come into their initial bloom. Flower stems will keep their shape into the winter and seed-heads will attract members of the finch family. Common disease and pests include powdery mildew, bacterial leaf spots, gray mold, leaf miners, Japanese beetles, and vine weevils.